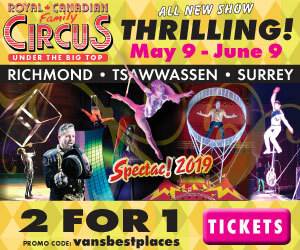 April’s 2019 Vancouver calendar features dates and events in the Lower Mainland including shows, concerts, spring festivals, markets and Easter events. Below is what’s happening on the different days of the month in April 2019. Note: Schedules are subject to change – check official event websites for exact details. Surrey Vaisakhi Parade – Punjabi New Year celebrations beginning by the Gurdwara Dashmesh Darbar Temple at 12885-85th Avenue in Surrey. As many as 300,000 people attend! Earth Day Parade – a small parade and festival attracting up to 2000 people on Commercial Drive and at Grandview Park. Easter at the Cannery – at the Gulf of Georgia Cannery in Steveston Village. Eggciting Easter Hop – egg-hunting (for children ages 0-5) and other family-friendly activities at VanDusen Garden. Peteys Easter Eggstravaganza – an egg hunt, visits with the Easter Bunny, petting zoo, train rides and other kid-friendly activities at Fantasy Farms in Chilliwack. Bike the Blossoms – a free cycling event that’s part of the Vancouver Cherry Blossom Festival. The 10 to 12-km route runs from 11 am to 1 pm starting at Trout Lake. Chilliwack Tulip Festival – Western Canada’s largest tulip festival featuring close to 20 acres of flowers in Chilliwack. This is an amazing event and highly recommended. Abbotsford Tulip Festival – 10 acres of tulip fields open to the public in Abbotsford at 36737 North Parallel Road. Darts Hill Garden Park – a semi-private garden park that’s open to the public by donation from 11 am to 3 pm at 1633-170th Street in Surrey. Pop-Up Roller Rink Disco Night – family skating, short track roller derby and adult skate sessions at Robson Square at 800 Robson Street. Tickets are $15 for adults and $10 for kids. Click Easter Long Weekend for a comprehensive list of other fun Easter-related things to do. Make It Vancouver – a giant craft market at the PNE Forum at 2901 East Hastings Street. Tickets are $6 at the door or $3 in advance. Children ages 12 and under are free. Riley Park Farmers Market – at Riley Park and Vancouver’s Nat Bailey Stadium (at 4601 Ontario Street) from 10 am until 2 pm. Squamish Farmers Market – at the corner of Victoria Street and Cleveland Avenue in Squamish from 10 am to 3 pm. East Side Flea – a bi-weekly weekend market with about four dozen vendors selling vintage, collectibles, handmade and other items at 550 Malkin Avenue in East Vancouver (about 1.2 km from Science World). Family Favourites Movies – $2.99 movies at select Cineplex theatres at 11 am. 420 Vancouver – an annual protest and celebratory gathering of people who like to smoke marijuana. It attracts thousands and is either an event you’ll want to stay away from or go see out of curiosity and the interesting smells. In 2019 it happens at Sunset Beach Park at 1204 Beach Avenue and includes a concert by the band Cypress Hill. 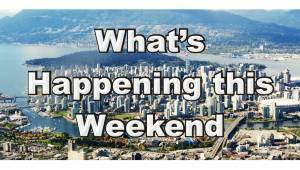 Easter Sunday – various Easter Long Weekend activities around the Lower Mainland. River District Golden Easter Celebration – a golden egg hunt and other free family-friendly activities take place at River District Vancouver from 9 am until 2 pm. 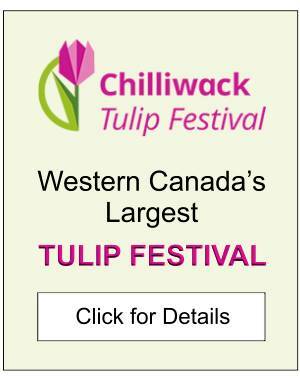 Chilliwack Tulip Festival – special Easter-related activities today at Western Canada’s largest tulip festival featuring close to 20 acres of flowers in Chilliwack. Easter Vintage Car Rally – a gathering of over 90 vintage vehicles on Easter Sunday. Click Vancouver Easter Brunches for a list of places offering fancy buffet brunches. Vaisakhi Carnival – amusement rides and a midway outside the Gurdwara Dashmesh Darbar Temple in Surrey. Earth Day – celebrations throughout Metro Vancouver (although some of them take place earlier in the month). Easter Monday – various Easter Long Weekend activities around the Lower Mainland. Chilliwack Tulip Festival – Western Canada’s largest tulip festival featuring close to 20 acres of flowers in Chilliwack. Brahm’s Tam Drum Circle – drumming takes place at Stanley Park’s Third Beach from early evening until sunset (but only if sunny weather). Free! World Music Fest – a multi-day music festival in Vancouver. Tonight’s event features Itamar Erez & Hamin Honari at Guilt & Co. in Gastown. Carnival at Ambleside – West Coast Amusements has its rides and midway set up at West Vancouver’s Ambleside Park from 3 until 10 pm (weather permitting). Menopause The Musical – an Off-Broadway musical about four women who meet in a department store while shopping for bras. (Note: the show is recognized as the longest-running scripted production in Las Vegas.) Cost is $55-$65. Museum of Vancouver – admission is by donation from 5 pm to 8 pm (as it’s the last Thursday of the month). Kickstart’s 21st Anniversary Celebration – a fundraising event featuring Gaelynn Lea in concert, a performance by David Roche, a silent auction and a visual arts presentation by Mujtaba Saloojee. Takes place at the Cultch at 1895 Venables Street in Vancouver. World Music Fest – a multi-day music festival in Vancouver. Tonight’s event features a tribute concert to Paul Simon’s Graceland album at the Imperial. Refresh Spring Market – a large market featuring locally-made and curated goods from 4 until 9 pm at the West Coast Railway Heritage Park at 39645 Government Road in Squamish. Friday Night Live – live music at North Vancouver’s Lynn Valley United Church at 3201 Mountain Highway. Tonight’s guest artists are from the Vancouver Adapted Music Society (VAMS). Carnival at Ambleside – West Coast Amusements has its rides and midway set up at West Vancouver’s Ambleside Park from noon until 11 pm (weather permitting). World Music Fest – a multi-day music festival in Vancouver. Tonight’s event features the bands Locarno and Mokoomba at the Imperial. Disposable Camera Project – an evening of photo displays, adult beverages and dancing from 8 until 11 pm at 1050 East Hastings Street. Admission is free and proceeds from photo sales go directly to the artist. An Evening of Socially Conscious Music – a performance by Sitar Virtuoso Anoushka Shankar at UBC’s Chan Centre. Tickets start at $46. Darts Hill Garden Park – a semi-private garden park that’s open to the public by donation from 11 am to 3 pm at 1633-170th Street in Surrey. Today features the garden’s official Open House & Plant Sale event. Port Moody Food Truck Festival – at Inlet Park at 3000 Murray Street. Motown Meltdown 2019 – a night of music and dancing in support of sight and the charitable organization Seva Canada at Vancouver’s Commodore Ballroom. Tickets are $32.75 (plus online fees) in advance or $45 at the door. Refresh Spring Market – a large market featuring locally-made and curated goods from 10 am until 5 pm at the West Coast Railway Heritage Park at 39645 Government Road in Squamish. The Vancouver Market – a small one-day market at the Wise Hall at 1882 Adanac Street in Vancouver. The event features over two dozen vendors selling everything from handmade goods to things like records, musical instruments, clothes, crafts, jewellery and other items. Admission costs $2. Vancouver Whitecaps – soccer game vs. Philadelphia Union at BC Place Stadium. Daffodil Dash – a 1K walk and 5K run to raise money for the Canadian Cancer Society. Multiple runs are being held in Greater Vancouver such as at West Vancouver’s Ambleside Park, Port Moody’s Rocky Point Park and Vancouver at the Concord parking lot across from Rogers Arena. Furry Trails Foot Race – 5K and 10K trail runs and walks at Derby Reach Regional Park benefiting the Langley Animal Protection Society. Carnival at Ambleside – West Coast Amusements has its rides and midway set up at West Vancouver’s Ambleside Park from 12 until 7 pm (weather permitting). 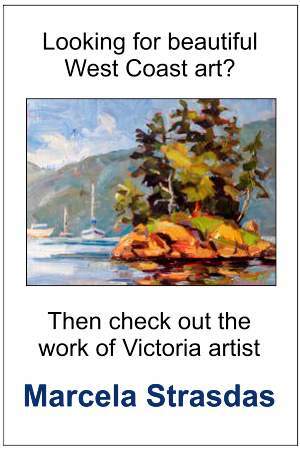 Spring Art Sale – featuring over 400 paintings at the West Vancouver Community Centre at 2121 Marine Drive from 10 am until 5 pm. Free admission. Vancouver Opera Festival – multiple days of opera productions (which, for 2019, have a fables and fairy tales theme). Today features a day of free stage performances including a show by CircusWest in the Queen Elizabeth Theatre Plaza (which is now called šx?? ?ex?n Xwtl’a7shn). Hastings Park Farmers Market – last market of the season from 10 am to 2 pm at Hastings Park by the PNE. Port Moody Winter Farmers Market – last day of the season for the market from 10 am until 2 pm at the Port Moody Rec Centre at 300 Ioco Road. Cannery Farmers Market – at the Gulf of Georgia Cannery at 12138 Fourth Avenue in Steveston Village from 10 am until 3 pm. With Marcus Mosley at 4 pm at St. Andrew’s United Church at 1044 St. George’s Avenue in North Vancouver. With Cory Weeds 4 pm at Surrey’s Northwood United Church at 8855 156th Street. G Day Vancouver – an event for girls (ages 10-12) and their parents and guardians that’s about celebrating and empowering girls. It takes place at Burnaby’s Nikkei Cultural Centre at 6688 Southoaks Crescent. The cost is $60. Vancouver Opera Festival – multiple days of opera productions (which, for 2019, have a fables and fairy tales theme). For information on what to expect weather-wise in the month of April and for a list of recommended activities, click April Weather and Top Activities. For a list of what to do over the Easter Long Weekend, click Easter Activities. To return to the top of the page, click April Calendar. To see what’s happening next month, click May Calendar of Events.